The Ratchaburi hospital crisis is over but many questions remain. One is why ten gunmen from God’s Army stormed a Thai hospital in the first place. Many Thai people lack sufficient knowledge about Burma to understand this case. They are, of course, still angry at the hostage-takers for endangering the lives of patients and medical staff. But the Thai media and academics are more aware of the issues surrounding the case. "I understand why they came here. I don’t like to just say that those people are bad. 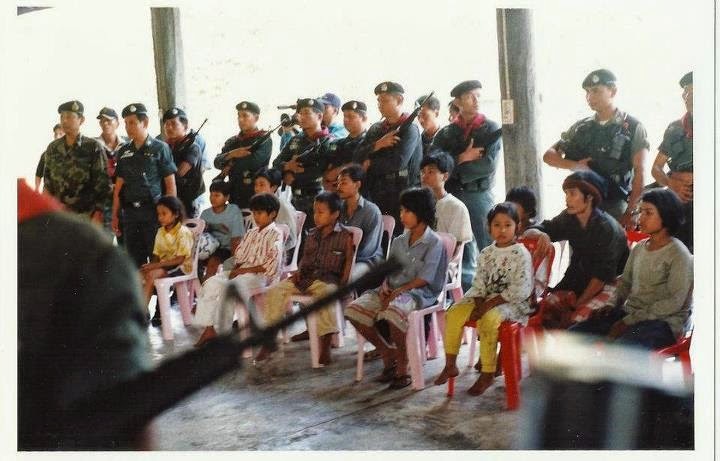 They have suffered life-long repression from the Burmese military. They have no way out, and came here to do something," commented Pornpimol Trichot, a well-known researcher from the Asian Studies Institute at Chulalongkorn University. The bus driver whose bus was hijacked from Ban Tagolan recalled, "They commanded me to drive to Bangkok. But when they saw the hospital, they said to stop. I thought that they had no plan." In fact, the Thai army was heavily shelling the God’s Army base at Kamaplaw while the SPDC troops were trying to occupy it. "They shelled Kamaplaw after four (Thai) soldiers were killed by a God’s Army landmine on January 18," confirmed a leader of the volunteer guard in Ban Phar Pok, the closest village to Kamaplaw. "(The rebels’) only choice was which way to die—sitting under the shelling or doing something before they died. They chose the second way." However, it is not the first time Burmese activists have resorted to such tactics. Similar incidents have occurred on three other occasions. In 1989, two Burmese students, Ye Yint and Ye Thiha, hijacked a Burmese domestic plane from the southern Burma town of Mergui to Bangkok with a fake bomb. In 1991, Ye Yint and Ye Marm hijacked a Thai plane from Bangkok to New Delhi. But in October 1999, dissidents did not use a fake bomb. They came heavily armed to the Burmese embassy in Bangkok. 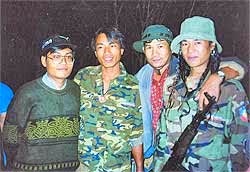 They planned to kill ambassador Hla Maung, who is close to the junta’s powerful general Khin Nyunt. "A decade is long enough to wait. We must change our strategy," declared Kyaw Ni, leader of the Vigorous Burmese Student Warriors, in a telephone interview during the embassy siege. "The time has come to shoot to the forehead of the key general." Kyaw Ni, or "Johnny" as he is more commonly known, explained that he had taken part in peaceful protests in front of the Burmese embassy in the past, and had also been a member of the All Burma Students’ Democratic Front. Now that 11 years have passed, he said that demonstrations and fighting against normal soldiers on the front line are meaningless. "The world community’s pressure is just talking. It will never be like Kosovo or East Timor," said Johnny. Nearly four months later, they came again to Thai soil to do something to attract the attention of the world community to their country’s political crisis. But this time, the Thai response was very severe. All ten gunmen in the Ratchaburi hospital siege lost their lives. "(The crackdown on Burmese dissidents) is not a real resolution, just a temporary one. If we cannot send them back to their own country, it will happen again. We must think how we can help to solve Burma’s crisis," observed Pornpimol, who is studying the situation of Burmese minorities in depth, especially the cease-fire process between the ethnic groups and the ruling junta over the last decade.